Book: Burnt Toast Makes You Sing Good: A Memoir of Love from an American Midwest Family by Kathleen Flinn. I’m always happy to find a book that sheds life on real life in the Midwestern United States. Too often those “fly over” states are ignored, or misunderstood. This food memoir understands life in Michigan–and as a bonus, life in Florida, too. Since I grew up in Ohio, Kathleen Flinn’s life sounded might familiar to me. She says in the introduction that she set out to write her parent’s life, but along the way discovered other generations were woven in so tightly that she had to include her grandparents, aunts and uncles, cousins and siblings as well. Each chapter tells a story that illustrates the importance of a particular recipe. For instance chicken and biscuits follows the story of her mother and father’s attempt at poultry raising and the downfall of a nasty rooster. You have to read the whole story to appreciate the denouement with her mother, half naked, locked in a chicken coop on a cold Michigan winter day. “Did you fix the coop?” Mother asked, stirring a pot of soup on the stove. “Yes, and I fixed the rooster, too.” Dinner the next day was chicken and biscuits. And you also have to read the entire story to appreciate a honeymoon spent fishing in an Upper Peninsula lake and hanging out with the bride’s parents. But it all makes sense when you get a look at Grandma Inez’ recipe for fried fish with almonds. Kathleen Flinn had her grandmother’s recipe box, her mother’s notes and oral history, and her own and relatives’ memories to draw on. Additionally, she obviously has done a lot of research to provide the context for the life of her family who struggled to survive while living on a farm, thrived in town life, and finally lived part of their lives in Florida. Because Flinn paints her family portrait with such telling details, we meet some very interesting people–some that sound familiar, because aren’t they in every family? and some that you’re glad were NOT in your family. But her most potent memories involve food and the stories of why her parents and her grandparents and others cooked the way they did. Flinn realizes that her love of food and cooking comes with her genes. Her parents had a restaurant in California for a time, both her grandparents (her mother’s parents) cooked, and her surroundings frequently influenced the food she ate growing up. 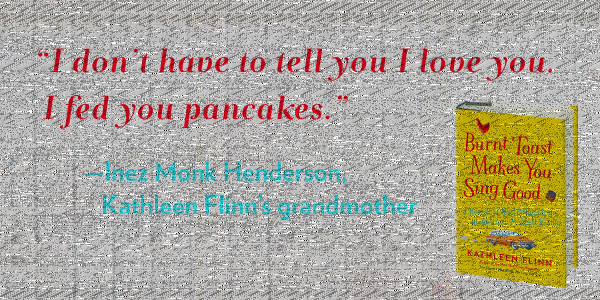 Flinn put a lot of thought into how circumstances influenced the food that her family ate. When they lived on the farm and shopped at the Thrift Store (which her mother called a Department Store so her youngest daughter wouldn’t be ashamed) her mother raised vegetables and chickens and canned hundreds of jars of food each year. When Flinn’s parents got better jobs and moved into town, they began to eat things that formerly had been considered out-of-reach luxuries, like frozen TV dinners, or meals at McDonald’s. Because the family joined a German-American club, even though they were not a bit German, sauerbraten and hot German potato salad played a role on their menus. As she grew up, much of Flinn’s cooking was influenced by watching Julia Child’s shows on a black and white, snowy TV set with a hand-turned antenna and reading Mastering the Art of French Cooking . Eventually she achieved her dream of attending Le Cordon Bleu in France. All these experiences taught her that the best food was not always the most trendy or the most expensive. Fresh caught fish would always beat out frozen fish sticks. Each chapter ends with a recipe. After describing the origin of the recipe, she gives us a slightly modernized version. For instance, she skips a lot of the mushroom or celery soup that seemed to be a prime ingredient in just about everything in the 1960s. On the other hand, she doesn’t fancy-up the recipes, these are American comfort food–Midwestern staples. You are not going to find the latest ingredients (no salted caramel or kale and blueberries) or fanciful presentations here. Instead, you get homey recipes for dishes like stew (see the recipe for that one at Ancestors in Aprons), refrigerator biscuits, apple crisp, oatmeal cookies, panfried steak or spaghetti sauce. I love the way she recreates a time and place. And I felt so connected to the people in her family that when I cook one of these recipes, it will be like borrowing from a friend. Burnt Toast Makes You Sing Good provides a great example for anyone planning to write a memoir or a family history–even if she is only intending to write it for her own children. Two quotes from the end of the book sum up the author’s most important lesson. Like Francie from A Tree Grows in Brooklyn I’m pieces of my parents, siblings, grandparents, and great-grandparents. The people in my past helped make me tough, passionate, and endlessly optimistic. And, she might have added, in love with food and family. I have included links to Amazon for your convenience. You need to know that I am an Amazon affiliate, so any purchase you make through my links helps A Traveler’s Library. Thanks. 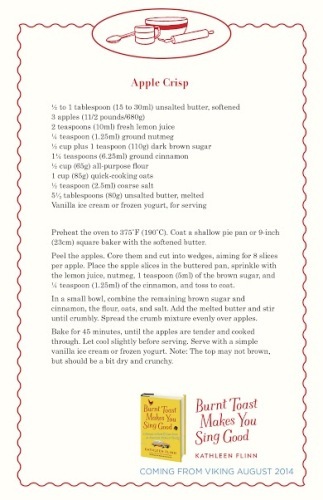 The insert with a quote form Grandma Inez and the recipe for Apple Crisp are used with the permission of the publisher, Viking, a member of Penguin Group (USA) LLC, A Penguin Random House Company. Copyright © Kathleen Flinn, 2014.